When I realized a few days ago that today would be a solo day for me I decided to have a 1/2 day of mindfulness to and for myself (which wound up being from about 10:00am-2:30pm). With my stepson at his mom’s, my husband out on a paintball adventure with friends, and my having no set plans or scheduled to-do’s I had the wonderful opportunity of an open, free day. Laziness is one of the hardest things for people in our modern society all over the world to practice. We think we’re being “lazy,” but we spend all our time watching TV and reading books and writing emails and catching up on errands and paying that bill and seeing this or that person. Laziness, in the Plum Village practice, means to allow the world to be as it is and to allow each moment to unfold just as it unfolds: to experience beauty, as I am right now, of the morning sun coming up; to watch the sky changing; to see the wind blowing in the leaves. 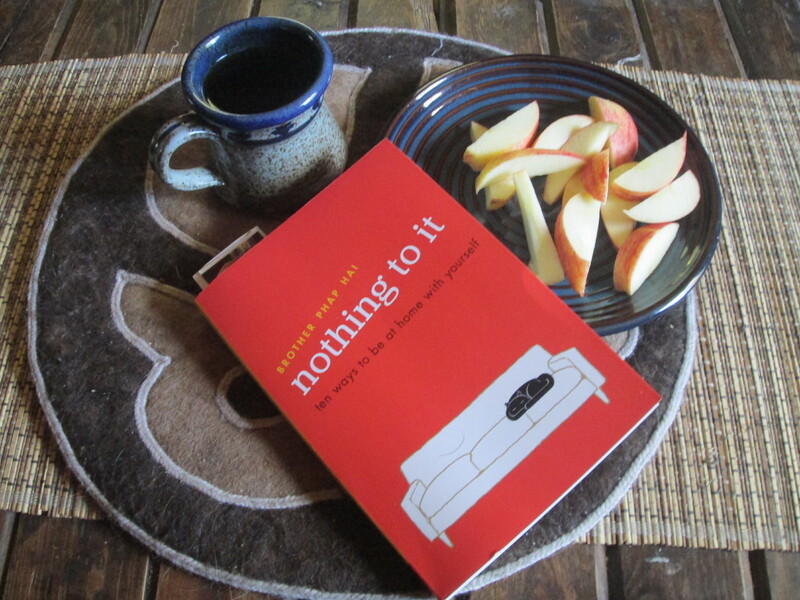 I very much liked his description of a Lazy Day so I decided to blend its spirit, as Phap Hai offered, with the energy of a day of mindfulness and see what unfolded. 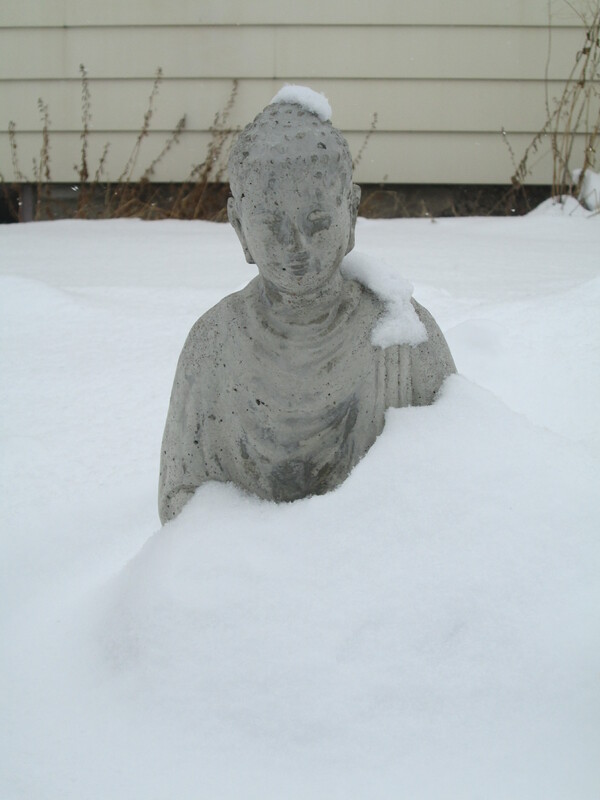 Yesterday, Sunday February 23rd, our Be Here Now sangha hosted a day of mindfulness. It was a lovely day of community building and strengthening of practice. We had a small varying group of 8-10 people. Throughout the day intermittent snow fell softly. Our theme for the day was cultivating joy and we wove it into our program through guided meditation, deep relaxation, a mindfulness teaching talk, movement exercises, and a creative project in which we made mindfulness verses. 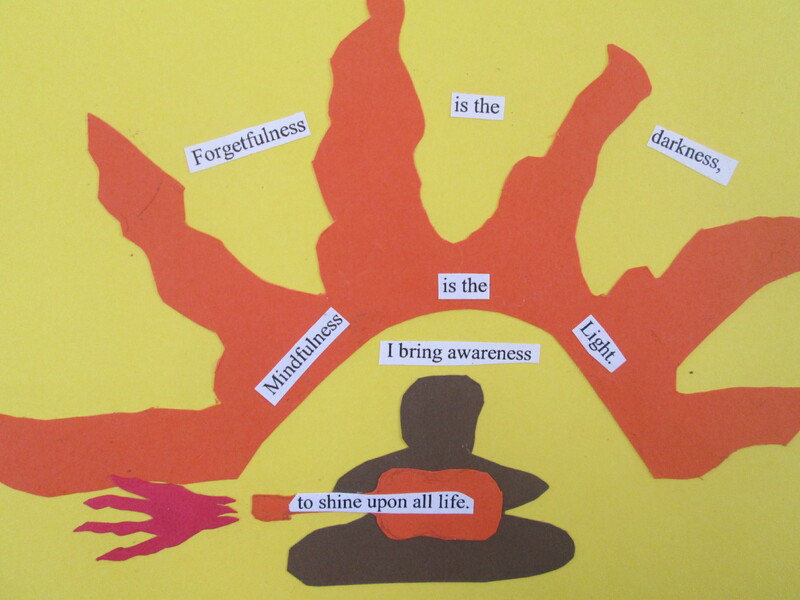 A mindfulness verse (also called a gatha) is a short saying that we can post around our home or office to help us remember to come back to the present moment. 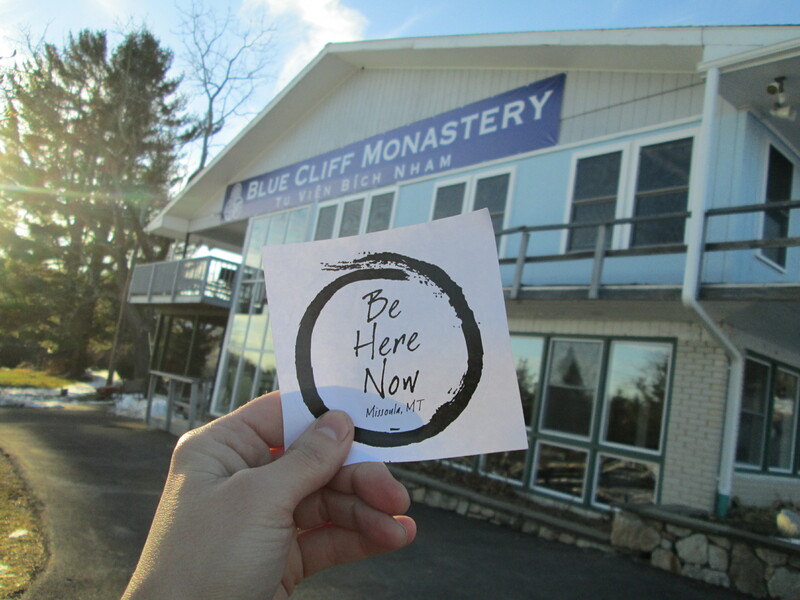 Today I had the wonderful opportunity to attend a day of mindfulness at Thay’s (Thich Nhat Hanh’s) monastery and practice center in Pine Bush, New York called Blue Cliff Monastery. 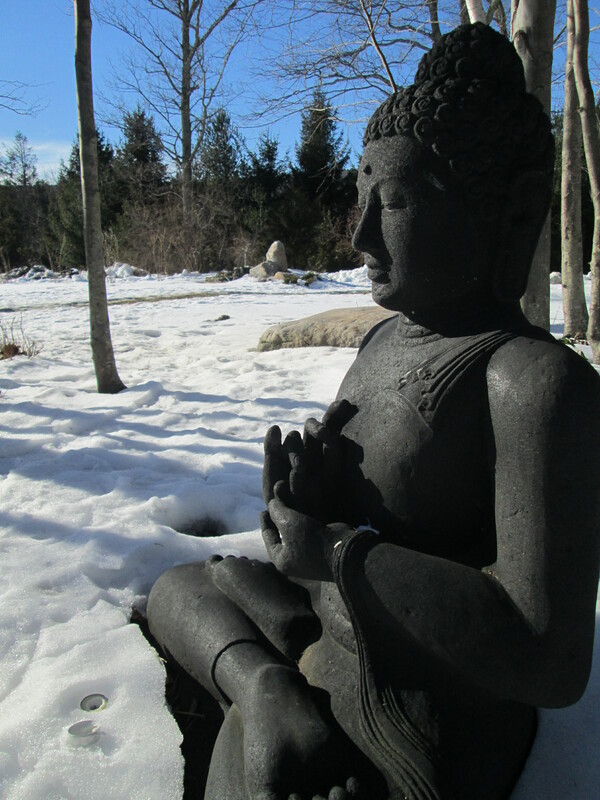 The monastery hosts two days of mindfulness each week on Thursdays and Sundays and they are open and free to attend. My mom and I drove up from the suburbs of Philadelphia, about 2 1/2 hours away. It was so lovely to be able to add this venture into my east coast trip of visiting family and friends and I was grateful that my mom wanted to come with me. 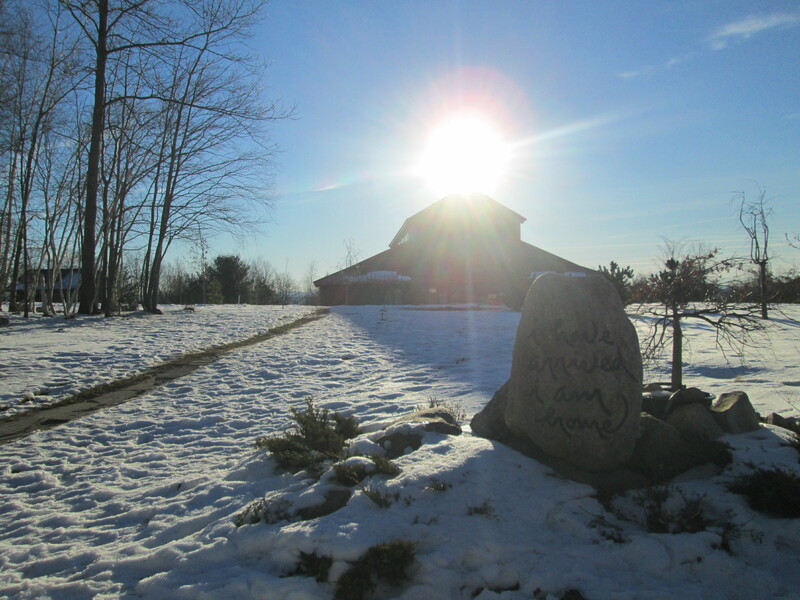 We arrived around 9:00am this morning with blue skies overhead and crisp snow underfoot. 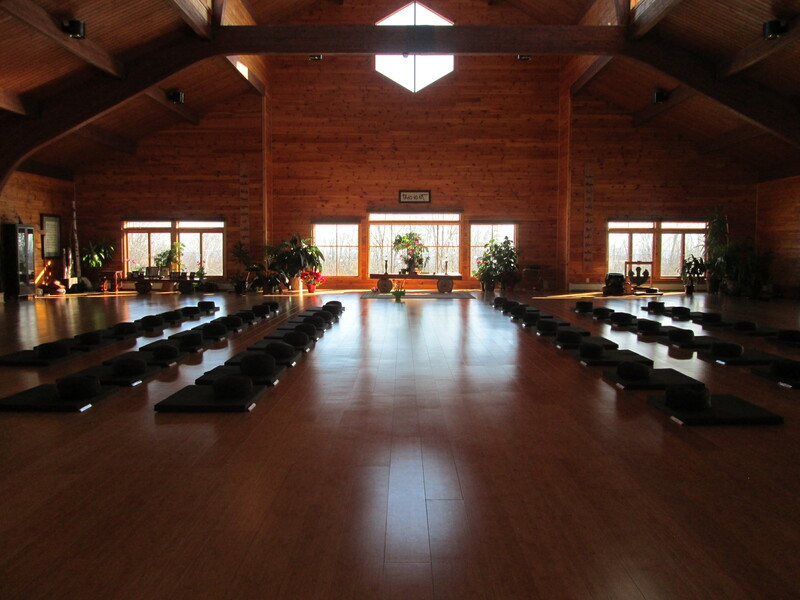 The picture above shows the dharma hall where the sitting meditation and other programs take place. The words I have arrived, I am home (displayed on the rock in the picture) is a deep practice in this tradition. It is a call to bring us back to the here and now. Our true home, the only moment we can be truly alive, is in the here and now. These words are a reminder. Like a good friend reaching out their hand to hold ours. We must learn how to handle our restlessness. We abuse our bodies and it causes restlessness in our body and mind. We cannot wait for others to come and make us more peaceful. Sitting meditation is the peace – if you cannot sit with peace this is not yet sitting. We have to remove the idea that sitting is hard labor. Sitting is an art. The breath connects the body and mind. Sitting meditation is very precious. We need to learn to sit and do nothing. Many people don’t know how to rest. Even when on vacation you may come home more exhausted and worn out because you do not yet know how to rest. If we sit for one hour and our minds are thinking, grasping, planning or worrying then this is restlessness, it is not restful. If we can sit in peace we sit for our mother and our father, our ancestors, our lineage and our country. In the beginning we can imitate others but then we don’t need to do that anymore. Gathas (short mindfulness verses) are an anchor. They can help us to not drift away (from the here and now). Like a boat has an anchor to help it not be swept away by the waves of the ocean. Gathas for walking meditation: Each step is a miracle, Each step is nourishing, Each step is healing, Each step is freedom. After the talk we had a short break and then reconvened for outdoor walking meditation. There were only about 7 or 8 of us laypeople there (meaning folks who were not monastics: monk and nuns) and maybe 15 or 20 monastics for the talk and 10 or 12 for the outdoor walking so it was a nice small group. For the walk we were led through the surrounding winter woods. The hard melting snow lent itself to uneven and slippery steps. With the slow cadence of walking meditation it was fairly easy to get proper footing as we wove around trees, rhododendrons, and little cricks. From time to time we would stop and breathe and take in the beautiful scenery. The walk was in silence and I very much enjoyed the fact that each step took great care and mindfulness naturally because of the snow and ice. 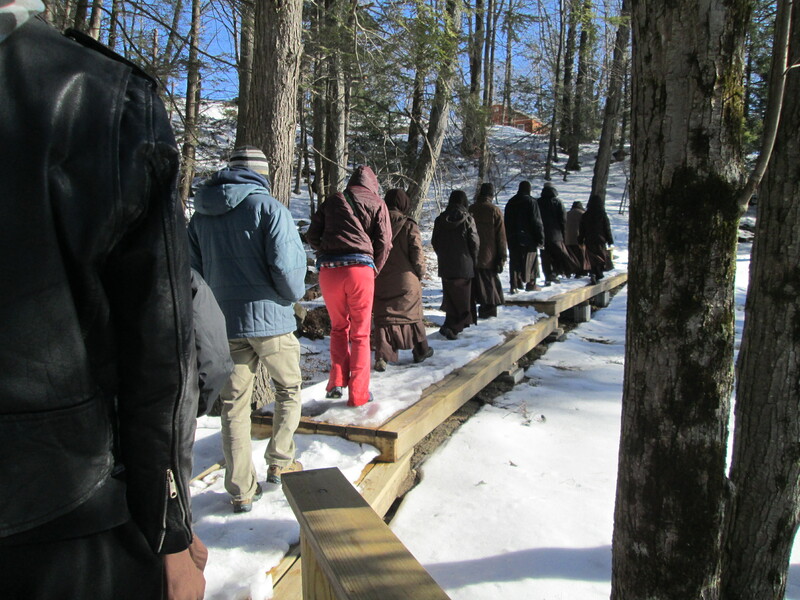 One of my favorite moments on the walk was when at a particular resting point some of the monastics proceeded to throw snowballs back and forth at each other :) A good reminder that silliness and playfulness are important parts of the practice. After the outdoor walking we had a delicious vegetarian lunch served in the dining hall. We ate in silence, which I very much enjoy. To have the space, time and quiet to connect deeply with the food in front of me is of great benefit to my practice. In my rice, tofu, and vegetables I looked deeply to see the sun, earth, clouds, farmers, workers, transportation, gasoline, roads, stores, and cooks within the food. It is easy to eat our meals quickly without much thought of gratitude for the conditions that brought the food to our plate. When I can eat my meal with respect to the path its traveled I am practicing to have reverence for life and to not be swept away by my selfish and greedy states of mind. 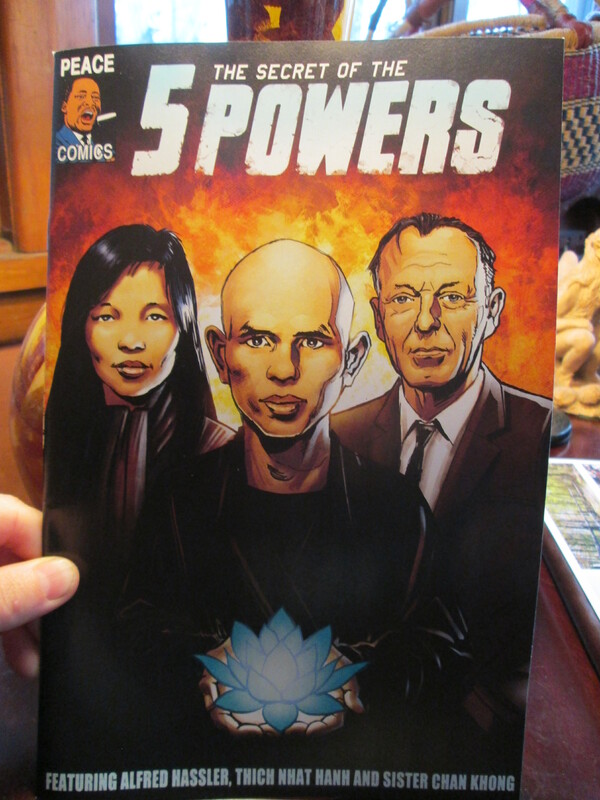 Thich Nhat Hanh comic book. Check out peaceisthewayfilms.com for more info. There were 7 of us for the dharma sharing circle. We shared silence and most everyone spoke about their practice and what was going on for them in their daily lives – it was quite nice. Afterwards I spoke a little bit with another OI member (Order of Interbeing) and then we took off back towards home. It was lovely to be able to spend time in one of the monasteries on a more intimate and personal level. The other two Thich Nhat Hanh monasteries I’ve visited were with 900-1,200 other people on large retreats. All of the brothers and sisters (monks & nuns) were very warm and friendly. 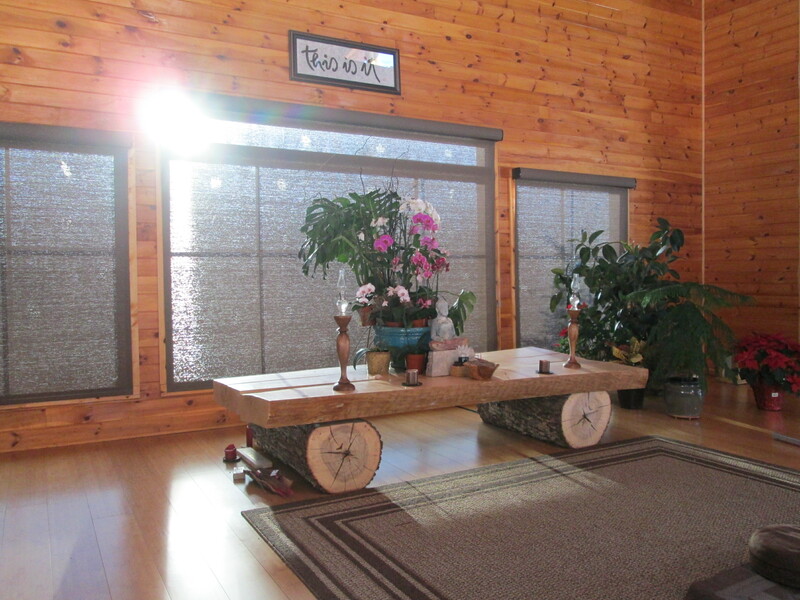 It was an easy place to visit and enter into the flow of mindfulness and community. I feel so fortunate to have received this opportunity. To bask in the glow of I have arrived, I am home with our in breath and out breath is also to practice stopping and resting. To practice stopping and resting is to practice taking good care of ourselves. And to take good care of ourselves is to take good care of those around us. We do not need to go to a monastery to practice. We can practice in the very here and now, wherever we are, whomever we’re with.